Fascinated by the multitude of architectural angles found in modern city landscapes, the artist creates abstract compositions, where the familiar shapes transform to the point where their meaning is completely lost. 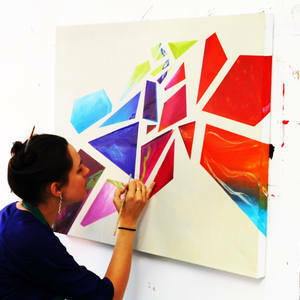 Geometrical objects, outlines and grids are a direct response to the vibrant environment that surrounds the artist. In their solid shapes and vibrant colours the artist searches for an escape from the everyday into a world more perfect, brighter and positive.